The Adirondacks was the first place Americans embraced the wilderness as a feature of civilization. 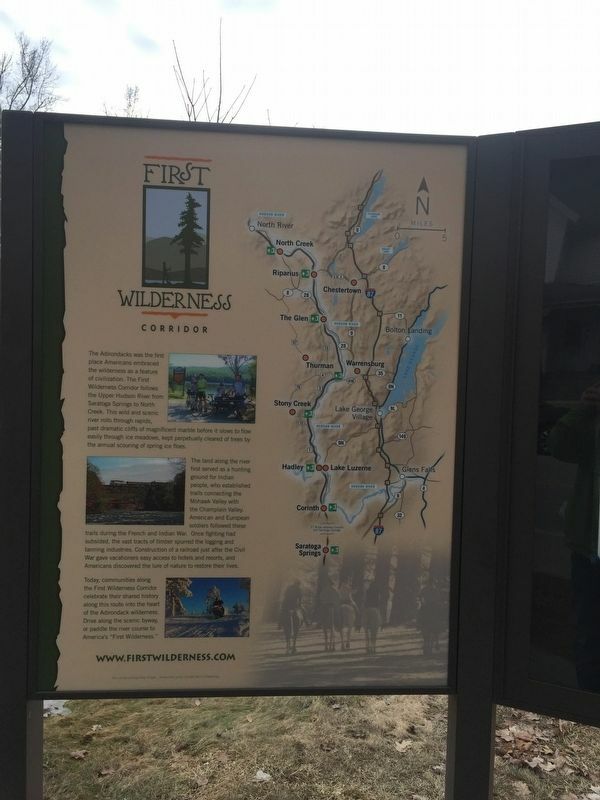 The First Wilderness Corridor follows the Upper Hudson from Saratoga Springs to North Creek. This wild and scenic river rolls through rapids, past dramatic cliffs of magnificent marble before it slows to flow easily through ice meadows, kept perpetually clear of trees by the annual scouring of spring ice floes. The land along the river served as a hunting ground for Indian people, who established trails connecting the Mohawk Valley with the Champlain Valley. American and European soldiers followed these trails during the French and Indian War. Once fighting had subsided, the vast tracts of timber spurred the logging and tanning industries. Construction of a railroad just after the Civil War gave vacationers easy access to hotels and resorts, and Americans discovered the lure of nature to restore their lives. Lake Luzerne presides on the banks of the Hudson River at one of the most picturesque spots of the river’s run from the Adirondack Mountains to the Atlantic Ocean. Here, the water from Lake Luzerne joins the Hudson at a narrow gorge of tumbling water at Rockwell Falls, which can be seen best from the north side of the Bridge of Hope. A little further south, the confluence of the Hudson and Sacandaga rivers form Phelps Bay, a stretch of water broad enough for water skiing. These historic waterways were used by Mohawk, Abenaki, and Iroquois Indians to travel between what is now known as Johnstown to Lake George. Located at the foothills of the Adirondacks, Lake Luzerne‘s first settlements included grist mills, saw mills, a creamery and cheese factory, distillery, and even a shirt factory; but leather was Luzerne’s biggest business during the last half of the nineteenth century. The first pulp mill in the United States using American-made equipment was built at the outlet of Lake Luzerne, it still stands with some of the original machinery as a public museum, and together with an iron ore smelter, a gristmill, and sawmill, are included in Mill Park. Adirondack Folk School is a unique school providing hands-on classes teaching the arts, crafts, and culture of the Adirondack region on Main St. Location. 43° 19.147′ N, 73° 50.494′ W. Marker is in Lake Luzerne, New York, in Warren County. Marker is on Main Street, on the left when traveling north. Touch for map. Marker is in this post office area: Lake Luzerne NY 12846, United States of America. Touch for directions. Other nearby markers. At least 8 other markers are within walking distance of this marker. First Methodist (within shouting distance of this marker); Jessup's Patent (about 400 feet away, measured in a direct line); Garnar Tannery (about 600 feet away); Church Of Rockwell Falls (approx. 0.2 miles away); Jeremy Rockwell (approx. 0.2 miles away); Paper Mill (approx. 0.2 miles away); St. Mary’s Church (approx. 0.2 miles away); Site of Wayside Inn (approx. ¼ mile away). Touch for a list and map of all markers in Lake Luzerne. More. 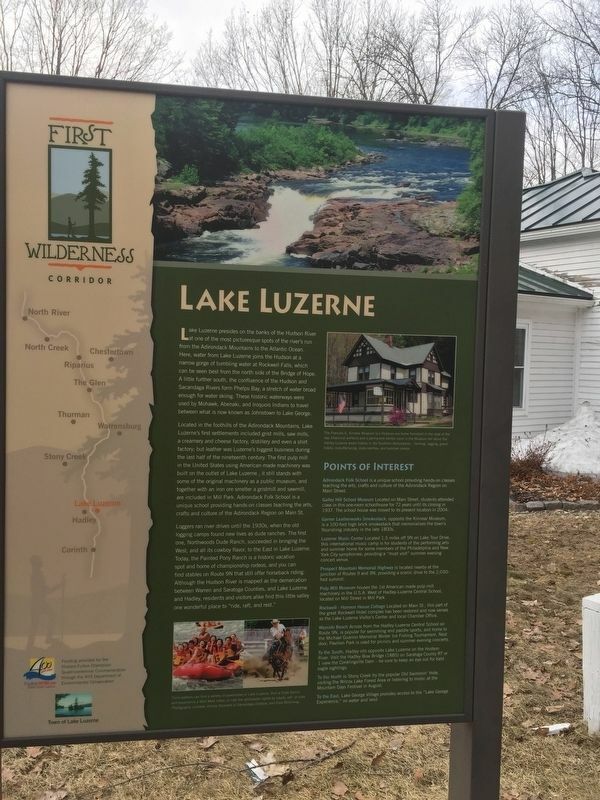 Search the internet for First Wilderness/ Lake Luzerne. Credits. This page was last revised on April 4, 2019. This page originally submitted on April 4, 2019, by Steve Stoessel of Niskayuna, New York. This page has been viewed 59 times since then. Photos: 1, 2. submitted on April 4, 2019, by Steve Stoessel of Niskayuna, New York. • Bill Pfingsten was the editor who published this page.